Photo Album by Teri Bernhardt-Rodriguez - over 900 photos!! Racing kicked off on Thursday morning for the Middle Schools around 10:00am for what was the first competition of the year for most of the schools attending. The races started with the Junior Varsity divisions leading into the Varsity divisions, with all four races finishing a little after Noon. The weather was fantastic, which is a rarity for Larry & Penny Thompson Park, particularly for so early in the season and in September. There were a couple of good races for all four team championships, but each winning team showed the same trend every single time: Depth. The key to success for all of the teams that won was that they were typically able to place their 4-5-6-7 runners inside the 3-4-5 runners of the runner-up school. And whenever you can start displacing team scorers with your back half of varsity, odds are you're going to be winning the contest. The most impressive individual performances of the day were the top three individual finishers in the girls varsity race who gapped the rest of the field by over 75 seconds. And by far the best individual stand out performance on the 2.1 mile length course was girls varsity individual champion Rahyah Andressohn as she set the MS course record by running an impresive time of 12 minutes and 32.01 seconds. Considering she and the next top five finishers are all seventh graders, the rest of this season and next should be very exciting for Miami MS Girls XC. On the boys varsity side, the near sweep by Belen eight graders (1-2-3-4-8-10-13) shows that the Wolverines' dominant trend should continue in the year to come not only in Miami, but state wide. Kudos to all of those great athletes and their coaching staffs. Picture of the Middle School Awards can be found here, courtesy of Coach Victor Arrieta of Belen Jesuit. Thanks, Victor!! The girls JV race kicked off at 3:30pm to start the competition and although it was the earliest high school race, they probably had the best weather out of all four. The last couple of years this contest has always been a tight battle between John A. Ferguson and Lourdes Academy, but with smaller numbers than usual for Lourdes (due to many of the athletes traveling to UF this weekend), Ferguson was able to secure the win by a decent sized margin. The Falcons ran a tight pack race from beginning to end and finished with their top five under the 23:50 barrier and ran a spread of just under 50 seconds as well. Lourdes Academy finished as your runner-up team, more than fourty points ahead of the third place team. Individually Annemarie Jude from Lourdes led the way for the majority of the race until Sydne Garcia from Ferguson moved up on Jude in the second half of the race to run away as the individual winner. Elizabeth Macgowan of Ferguson made a late surge down the final straightaway to secure individual runner-up honors, edging Lourdes' Jude by just one second. The Girls Junior Varsity Top Ten Individuals. First through fourth on top, sixth through ninth on the bottom. 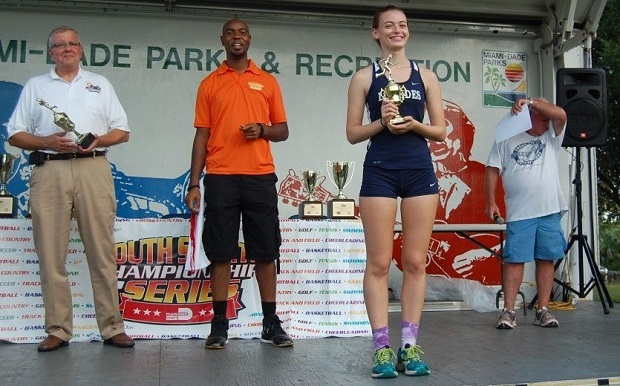 Annemarie Jude, top JV finisher from Lourdes Academy, representing her team with their Runner-up team trophy. The Girls Junior Varsity Champions from John A. Ferguson HS with Coach Ryan Raposo. The boys JV race was a bit more competitive than the girls JV race as three teams made a big push from the beginning of the race. 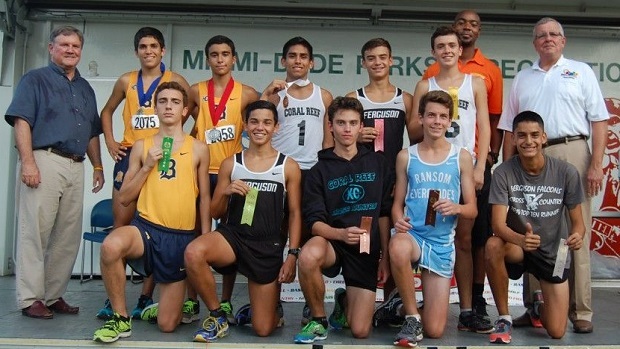 Even through the finish there were three boys from each of the three top schools: Belen, Coral Reef, and Ferguson, that finished in the Top Ten Individually. Of course when your athletes place first and second as Andres Signoret and Alejandro Corzo from Belen did respectively, it greatly helps your teams chances of bringing home the W, which Belen did for the seventh consecutive year for the junior varsity division since we've started keeping official records of the JV races for the Youth Fair Championship. Coral Reef finished 16 points back for Runner-up honors while Ferguson finished 13 points behind that to pick up the third place finish. The Boys Junior Varsity Top Ten Individuals. First through fifth on top, sixth through tenth on the bottom. 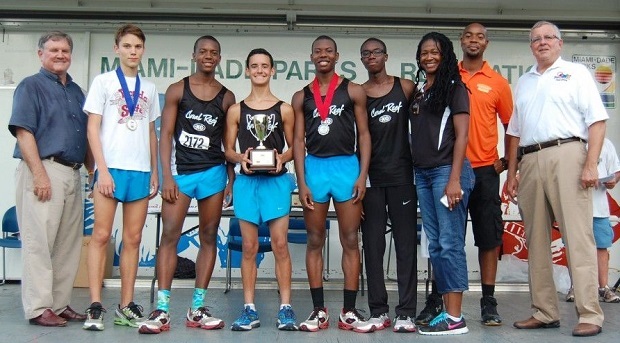 The Boys Junior Varsity Runner-up team from Coral Reef HS with Coach Maya Scott. 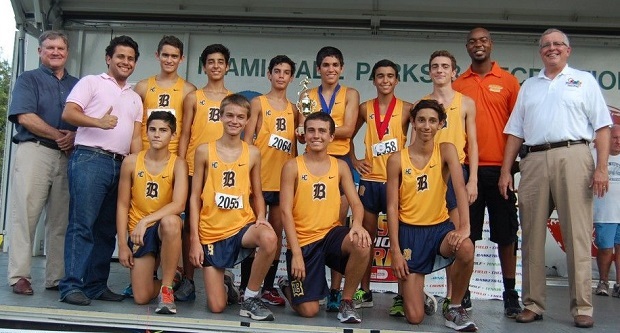 The Boys Junior Varsity Champions from Belen Jesuit with Coach Rene Medina. For the first time in over fifteen years, the girls varsity race was anticipated to be the most competitive it has ever been. 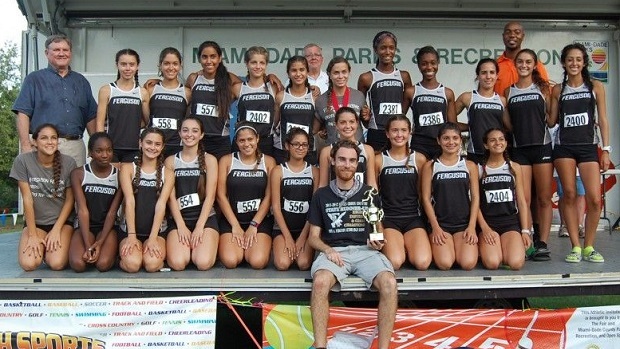 The Miami-Dade County Championship had been brought home by only two schools since 1998: Lourdes Academy from 1998-2010, followed by John A. Ferguson from 2011-2013, with most all of those races being won in a landslide. But with Ferguson graduating four seniors from last year's championship team, and other county programs looking very strong, any one of six different schools looked to be in the hunt for the 2014 title. 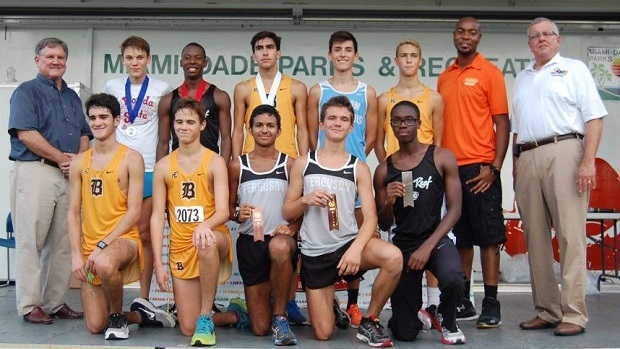 In fact, the virtual meet had the rankings as a close battle for first between: Ransom Everglades, Westminster Christian, and Lourdes Academy, with three other schools not too distant behind them, St. Brendan, Coral Reef, and Ferguson. And by the time the girls varsity race rolled around, the heat of the day would be a test to see which team could strive for the win over the competition. (Note: However, as mentioned above in the girls JV section, Lourdes is traveling to UF this weekend and opted out of the varsity division). Through the mile mark, Alyssa Pujals of Gulliver and Lauren Archer of Ransom led the way only a second apart from each other with good ten second lead over Aylwyn Hernandez of Ferguson. Only five seconds behind her started a massive pack of runners from all of the above mentioned schools, plus Northwestern, and a couple from Mater Academy. In fact, the two teams through the mile with all top seven (inside everyone else's top five) were both Northwestern and Coral Reef. Westminster and St. Brendan looked strong as well, while Ransom's team was fairly spread out, and the Ferguson pack was behind the masses but moving up. At about the halfway mark on the course the individual leaders did not change, Lauren Gavulic of Ferguson pushed herself up into the fourth place slot, and then once again came the masses where the Northwestern girls fell off from their hard early pace, Coral Reef looked to be in a strong lead with five girls before anyone else's fourth girl, and with Ferguson starting to move up passing their competitiors. Coming down the final straight away there was a hard surge put in by Ransom's Lauren Archer and with under 100 meters to go, as she made the push into first place and held on with the kick to win in 19 minutes and 23.30 seconds, a three second margin over Gulliver's Pujals. After that came Hernandez and Gavulic of Ferguson, followed by a variety of girls from the different top programs that were all in contention for team honors. But once the points were tallied, the girls from Ferguson's late push was enough to secure their fourth straight county championship as they were able to place six girls in the top 24 places and inside every other team's top four, as they ran a strong 45 second spread from third through sixth girls which is what primarily secured the victory. Coral Reef brought home the runner-up trophy just 21 points behind as they beat out Ransom Everglades, Westminster Christian, and Miami Northwestern as your top five finishing teams. The Top Ten Girls Varsity Individual Finishers. First through fourth on top, fifth through eighth, tenth on the bottom. 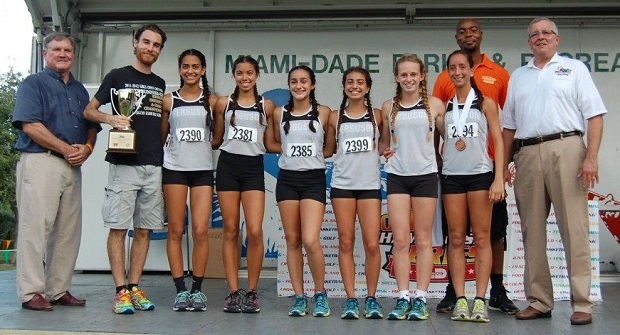 The Girls Varsity Runner-up team from Coral Reef with Coach Maya Scott. The Girls Varsity Champions from John A. Ferguson HS with Coach Ryan Raposo. While the girls varsity race looked to be one of the most competitive races in many years, the boys race looked to be a little different. The easy favorite team was the boys from Belen Jesuit who had not only succesfully dominated Miami-Dade the past three years, but also has made their mark as the premier program in the state the last three years. Althougfh some might say this team isn't as good as the previous years, the season is still very young, but Belen still looked to be a notch over their local competitiors. 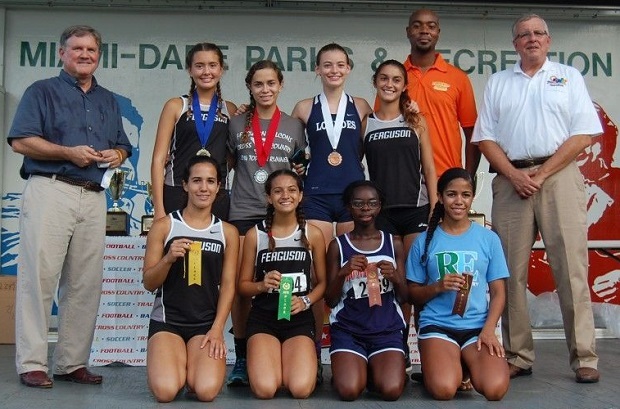 The real race appeared to be for second place honors between Coral Reef, Sunset, Ferguson, Columbus, and Ransom Everglades. From that perspective, it looked to be another competitive race very simiarly to the girls division. Unfortunately however a couple of teams also opted out of yesterday's competition (Sunset and Columbus did not race in the varsity division). As the competition took off, Kurt Convey of Coral Reef looked to be the strong favorite. He came off a major sub-16 win at Katie Caples last week, and his rival Nick Diaz from Sunset was not in attendance, but that did not mean he wouldn't have his work cut out for him with a very tough competitor Ryan Rodriguez of Belen running right on his tail, and of course Kurt's Barracuda teammate, Carlin Berryhill, who has been very impressive over the past year and who is still maturing. And just as expected the individual race played out to how most thought it would be, the Coral Reef duo, Rodriguez leading a squad of his Belen teammates, and a very strong Gaby Correa of Ransom Everglades in the mix as well. When it was all said an done, Berryhill got the kick on Rodriguez allowing for the 1-2 finish for Reef, but that didn't stop Belen's pack from being up in the front, four in the top seven, nor a few of athletes from Ferguson and Coral Reef packing it in at the finish. So as expected by many, myself included, the boys from Belen Jesuit secured their fourth consecutive county championship beating out Coral Reef, and doing so by a margin of 16 points as they placed seven inside Reef's fifth man. Ferguson finished in third place overall with a strong 1-5 pack of 24 seconds, but that was not enough to beat the Reef squad that brought home only three points with their top two finishers. However, Ferguson was able to place their top seven inside the #2 man from the fourth place team, Ransom Everglades, who was able to place their top seven inside the fifth place team's fifth man. Not to be outdone, your fifth place team, Coral Gables, did the exactly the same, placing seven inside the next best team's fifth runner. If there was ever a meet to look at as an example of one team's depth over another teams depth, and repeatedly done by each team, this was that meet. The Top Ten Boys Varsity Individual Finishers. First through fifth on top, sixth through tenth on the bottom. 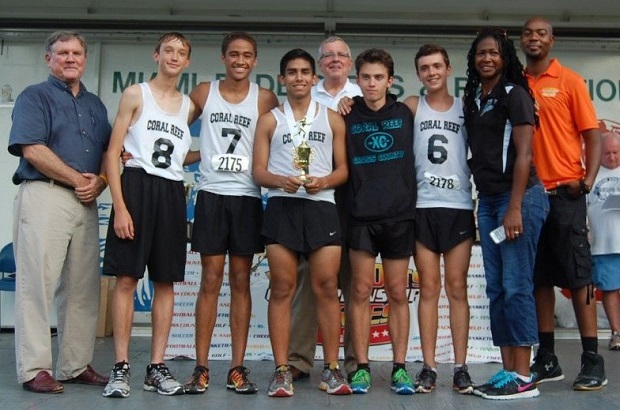 The Boys Varsity Runner-up team from Coral Reef with Coach Maya Scott. The Boys Varsity Champions from Belen Jesuit with Head Coach Frankie Ruiz (navy) and Asst. Coach Rene Medina (pink).